Domino Confuses and Optimizes with Sugar Package Change – StratGo Marketing. Plug-in marketing department services. Converting a product from a resealable pouch to a flip-top canister is a dramatic packaging change. Different enough to confuse the shopper that brought it to my attention. Too buried among tens of thousands of SKUs for the in-store customer service team to know the scoop. Finally solved by calling Domino and getting the explanation. The shopper that shared this story with me had the pouch version in her pantry. She needed more and couldn’t find it in the store, where the customer service team was also not in the know. Here’s what happened. Domino changed both the product name and structural package at the end of 2013. 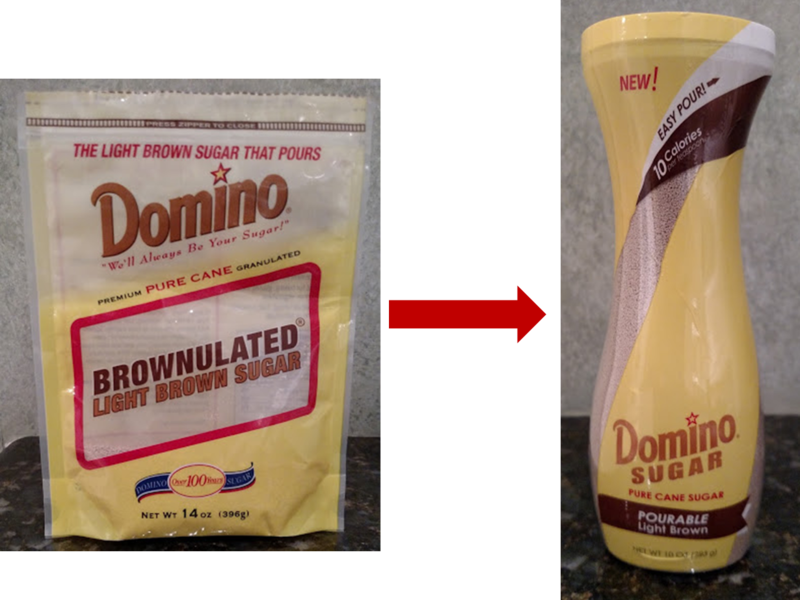 Domino® Pourable Brown Sugar in a canister was launched, replacing via name and structure its predecessor Domino® Brownulated® Light Brown Sugar. My shopper only uses the product on a limited basis for a special recipe. She probably bought the pouch version before the retail shelf switch-over to the canister. Domino’s new packaging was and is a clear consumer upgrade, which resulted from good marketing. Packaging changes are not easy to implement. They require significant logistical and communications planning. For instance, it’s always a shopper awareness challenge when marketing teams revise package graphics. And, it gets more complicated when the entire structure changes, which can cause a much deeper level of disruption, even in a clear upgrade situation. These are the marketing trade-offs that must, and can, be managed for the longer-term benefit. While existing users may struggle a bit, new users or competitive switchers may be brought in. Usage frequency and/or purchase loyalty may also increase. It’s all part of the payout equation. And, as a last resort, a friendly response from the customer service team can hopefully soothe it all out. Unless the shopper has given up and moved to another choice! Well packaging is changed, but i still cannot find it……is it available in Washington state, and if so which store carries it. Thank you for you time, i really would like to buy some. Thanks for reading. I’m not affiliated with Domino Sugar. Here’s their website contact information: https://www.dominosugar.com/contact-us Good luck.